Serves 4-6. Preparation time 5 minutes.Cooking time 20 minutes. • Make 4 deep cuts into the top of the cauliflower and 4 across, taking care not to cut too deep otherwise the cauliflower will break apart. Mix the butter, garlic, spring onions, dates, almond slivers and honey into a paste. Use the tip of a knife to fill the cuts in the cauliflower with the paste. 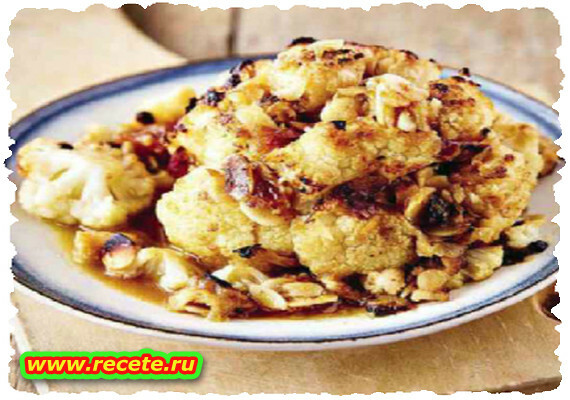 • Squeeze over the lemon juice and wrap the cauliflower in 2 layers of foil. • Braai over warm coals, turning frequently, for 20 minutes or until tender.